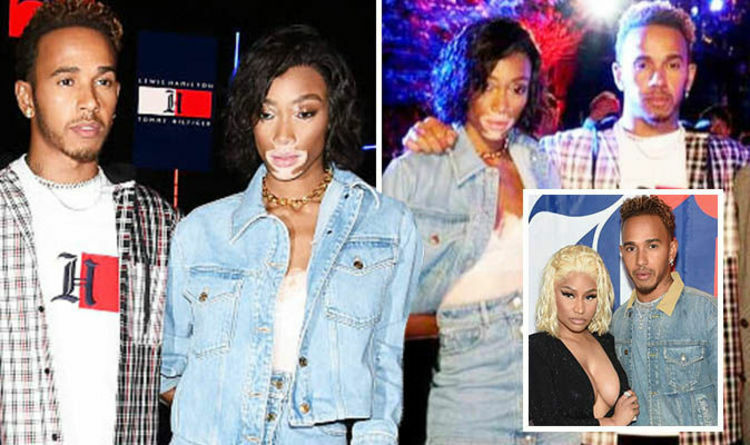 Formula One star Lewis Hamilton set tongues wagging after he shared videos of himself enjoying a night out on the town with model of the moment Winnie Harlow. The 33-year-old uploaded clips of himself and the 24-year-old partying together with fashion designer Tommy Hilfiger and Justin Bieber’s fiancé Hailey Baldwin in Tokyo. In his Instagram Story, the racin driver is seen standing next to the catwalk star, who wore a stylish denim co-ord with a lace bralette. When he panned the phone around, Hailey, 21, and Tommy, 67, were shown playing up to the camera, with the latter displaying a huge grin. Then in the second video, Lewis danced alongside Winnie as she sang the words to Stefflon Don and French Montana’s hit Hurtin’ Me. Dancing behind the pair was Hailey, who sported an oversized blazer and baggy cargo pants, which she wore with black heels. Winnie also shared the video to her Instagram page, as well as several pictures from the night, including one of her and Lewis laughing. In the sweet photo, Winnie sat beside Lewis, who donned a contrasting checked shirt over a printed white T-shirt. The duo looked to be enjoying each other’s company as both were captured giggling. It comes after Lewis was reported to be dating 35-year-old rapper Nicki Minaj after they both posted pictures from an outing in Dubai. They were photographed riding a quad bike in a desert last month, where they hid their grins behind their helmets. In the picture shared on Instagram, Nicki sat behind Lewis on the ATV, holding onto her headwear as they posed for the camera. Meanwhile, Lewis uploaded a snap of Nicki positioned between his legs as he sat at the back of the vehicle. Formula One champion Lewis uploaded the picture with the caption: “Riders”. Neither Nicki or Lewis have confirmed or denied whether they are officially dating, but Nicki recently hinted at a possible new man in her life. Speaking on The Ellen DeGeneres Show, she said: “Well, there was a new boy but he and I kind of fell back a little bit.